Running in the middle of the northern Midwest winter is a gamble as you never quite know what to expect. Thankfully, I'm not the only psycho that is willing to take a chance with the cold! Approximately 288 runners braved the weather to run the Frozen Feat 5k/10k last weekend. On Saturday morning, my family and I loaded up in the van to head to the race. Unlike the previous weekend with a -12°F windchill at the peak of the day, this Saturday was set to be a sunny +18°F! We didn't have a super early morning, leaving at 8:00 am to make it to the packet pickup before 9:15. The kids are up at the crack of dawn anyways. They were rarin' to go! When we arrived at the race, I jumped out to get my packet and race number while Leo and the kids found a parking spot. They had a parking ramp just across the road with plenty of room that made parking a breeze. After my family parked, we met up inside the school where all the pre- and post-race activities were being held. We were very thankful to have a warm place to wait, especially with a new baby and the big kiddos in tow. At 2 & 4 years old, our "big" kids are still too small for the really cold days. I used my new BibRave Pro BibBoards to secure the number to my jacket and they worked wonders! They snapped easily on to my jacket and stayed in place all morning. Around 9:15, I gave my guys hugs and kisses before heading out for announcements and takeoff. It felt chilly outside but I very much enjoyed this break in the weather and being able to run by myself. Getting outside for a run is something I don't take for granted with a young babe in the house! The 10k'ers lined up at the Start and after a few announcements we were off. I took off too fast for my current fitness level because A) I was really excited to race again and B) It's been a while! When I peeked at my watch, seeing the 6:40 pace helped me calm it down a bit: either I slow down now or I will need someone to drag my body across the Finish later. I ran out of gas about right... here. Mile 2. The top two women had blazed by me long ago and honestly the lack of ease in maintaining a sub-8:00 was discouraging. Somehow my brain was remembering 2016's marathons and forgetting that we just had a baby. Every mile after this was ran on determination because my endurance didn't last long. The course ran mostly down a bike path with some road running mixed in and there was very little ice/slush to avoid this year! While last year was warm (40°F), staying below freezing this year made the path much more pleasant to run. I crossed the finish at 48:07 according to my watch and felt very glad to be done with that first race back. After crossing the finish, I walked around to cool down before heading inside. The race had a great turnout and it took me a while to find my family. A very sweet volunteer lady knew exactly which "guy with two kids and an infant carseat" I was looking for. "All boys?" She asked. Yes, m'am. That's my crew! We found a place for the kids to sit down and then I made my way to the post-run refreshments. They had an AMAZING spread this year! I'm talking mega huge doughnuts, beer cheese soup with popcorn (and possibly chili, too? ), hot chocolate, coffee, bananas, bottled water, etc. They really rocked the post-race refreshments. When I passed the doughnuts, I just stared. Such life-altering decisions shouldn't be rushed. I loaded up on all the food and ran into fellow small-town runner Lauren. We had connected via Facebook and it was great to meet in person! She ran a nice time in the 5k and we were able to visit as we waited for door prizes and the awards ceremony. Finding other runners in tiny towns isn't easy to do and runner fellowship is something I have missed since our last move! The little boys and I attempted a picture in front of the race backdrop and that turned into a near drama. E looks guilty because he nearly made the backdrop literally "drop". He was also embarrassed to take a picture with mom. Aren't we a little too young for that yet? C looks angry in his little carseat and W was purposely facing the opposite direction. Typical family picture for us. Leo did an epic job keeping these boys out of trouble all morning! I finished 3rd place female (same as last year) and received a plaque, mug and $20 gift card to Scheels. After the race, we ran our usual "big city" errands... Sam's Club, Menard's and Chick-Fil-A (the kids' favorite). The Scheels gift card will have to get used another day. A day out of town with the kids is exhausting enough, let alone racing a 10k in the mix. Overall, it was an awesome race day! It's now or never. I will keep this post-baby update brief! Baby C was my easiest pregnancy and birth yet my most challenging postpartum recovery (so far) because of the mastitis issue at 3 weeks postpartum... that was terrible. The challenge of having a third child is that, despite having a newborn in the house, life goes on! Big kids still need to be taken care of and the usual responsibilities are still there in the mix with exhaustion and around the clock nursing. I am SO thankful that we are through the newborn stage, as cute and cuddly as it is. We have found a more regular routine and I am PRAYING that Spring comes early so we can all go outside again. After carrying C to 40 weeks on the dot, I feel like I have been more patient with postpartum recovery this time. 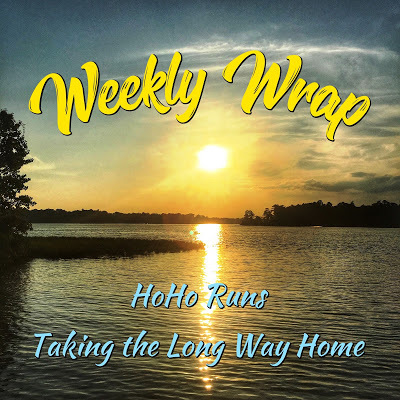 I have been focusing more on pelvic floor exercises, regaining core strength and started rebuilding my running base in January. I'm feeling pretty normal at 3 months postpartum minus being extra tired! God has graciously blessed us with three healthy, energetic little boys and we are enjoying the chaos thoroughly. So much in fact, that some days I need to drink two cups of coffee ;) The 10k race was a nice gauge to see where my fitness is at: speed is coming back gradually and endurance needs some work (or more so, time). Marathon training officials begins next week and my motto will have to be "graceful" training. By graceful, I mean that my run time and energy reserves are limited, so I'm going to do my best and give myself grace for the rest! In the end, I just need to cross that finish line in some shape or form, not run a PR (though that would be nice now wouldn't it?). Four months until Grandma's Marathon in June and thankfully our littlest will be 7 months old by then. In the meantime, I'm enjoying each day with my boys and praying for a full night of sleep someday soon. One can hope! What races are coming up on your calendar? Hello blogosphere, I'm still struggling with a writer's block/brain fog but I'm giving it a go today because it's February. February means Valentine's candy, our baby's third month exploring this world and the beginning of Grandma's Marathon training. 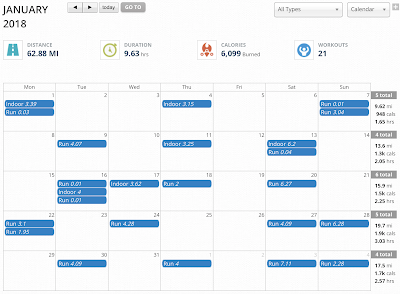 January was my "ease back into running" month and, despite it being brutally cold, all has gone well. 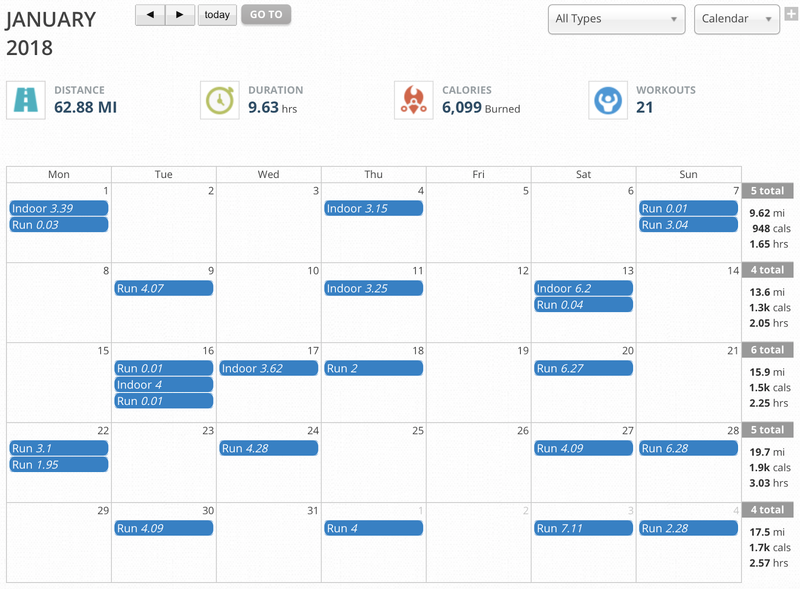 I just found the MapMyFitness app (that connects to my UA HOVR shoes) tracks my monthly mileage! For a lazy data runner, that's great. The shoes accidentally picked up random mileage here and there, probably while I walked around the house, but overall they did a great job tracking. 62.88 miles for January? Sure! I'll take it. That's better than any guess I would have had. Recently I posed a question via Instagram: Which training approach do you swear by? I've ran on Hal Higdon's plans for my earlier marathons and McMillan's for my last three. The debate was Hanson Method or stick to McMillan. For Grandma's Marathon, McMillan's Marathon Plan of running 4-5 days per week wins again. Considering our littlest is only 3 months old, I think it's best to stick to what I know. McMillan's plan made adapting my mileage to the realities of life fairly simple and that's a great fit for life with a new baby, 2.5 year old and almost 5 year old. On the home front, I can hardly believe how the time flies... except for when I look down at this baby and remember that our almost 5-year-old looked very similar to this... but now he's almost 5. That makes me a little teary eyed. It's great that our kids are growing but how have these years turned into such a blur in my memory? To briefly update, Baby C is 3 MONTHS OLD already! He's a sweetie and we all adore him. The big brothers are so full of love it's nearly suffocating. Please, give the baby just a little personal space. Maybe an inch. C is pretty much always smiling or sleeping or eating. Oddly enough I've tried to catch a picture of him frowning but I haven't been able to yet! I guess that's a good thing. Yet even his frown is adorable, to momma at least. He's an easy going baby, which has been a breath of fresh air. Our middle "W" is also a sweet, sweet boy but he was extra intense for the first 18 months of his life. Like I felt as though I was walking on egg shells 24/7. And no he's not sleeping through the night yet. We'll save that for his first birthday, too! I want to leave you with a thought from our kids’ favorite movie lately: Cars 3. Cruz: How did you know you could do it? Lightning McQueen: I don't know, I...I just never thought I couldn't. As training for my 10th marathon begins soon, I found Lightning McQueen's words oddly encouraging. Why do I think I can run another marathon in this new season of life with three kiddos at 7 months postpartum? I just never thought I couldn't. There's something to believing you CAN. Doubt makes a person shaky. As James 1:6b says about our faith in God, "the one who doubts is like a wave of the sea, blown and tossed by the wind." God calls us away from doubt and instead to BELIEVE. There is power in believing you can do whatever He calls you to. So how do you know you can do it? Pray past the doubt and choose to BELIEVE! Easy Run (Treadmill): 4 miles, 39:26 @ 9:51/mile avg. Bodyweight Strength Circuits by Run Far Girl: Squats, lunges, side/front planks, bicycles, bridges. Tempo Intervals (Treadmill): 4.04 miles, 35:00 @ 8:39/mile avg. 185 spm. Easy Run (Treadmill): 2 miles @ 9:40/mile avg. Do you have any fun Valentine’s plans? Disclaimer: I received AfterShokz Trekz Air to review as part of being a BibRave Pro. Learn more about becoming a BibRave Pro (ambassador) and check out BibRave.com to review find and write race reviews! Completely zoning out to music while on the run feels great but, let's be honest, it's not that safe. While some ear buds and headphones block out surrounding sounds to a dangerous level, AfterShokz open ear headphones deliver unrivaled situational awareness and comfort without compromising sound quality. As a BibRave Pro, I received Trekz Air — the lightest and most organically designed AfterShokz open ear headphones — to review. The bone conduction technology featured in open ear headphones uses transducers that guide mini vibrations through the cheekbones to the inner ears, delivering sound without plugging or covering them. The Trekz Air easily pairs up with my iPhone using Bluetooth 4.2. I turn on my phone's Bluetooth, then turn on the headphones and they pair up in seconds before I head out the door. From there, I stream my favorite playlist using the Spotify app. If the weather takes a turn for the worse, no need to worry. These headphones are IP55 certified to repel sweat, dust and moisture. When I run indoors, I'm usually multitasking a workout with watching our children for about 99% of those treadmill runs. My ears need to be open and I need eyes on the back of my head! Three boys can be mischievous little monkeys. Even the littlest guy - I try to time runs around his nap time but that isn't a guarantee. 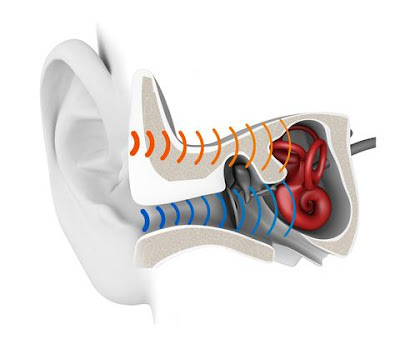 Because of the open ear design, I am able to listen to music while keeping an "ear" on my older kiddos or our waking-from-his-nap baby. The Trekz Air's rechargeable lithium ion battery lasts for 6 hours of music or calls. If the battery is completely depleted, it takes only 2 hours to fully recharge with the micro-USB cable. The Trekz Air wireless headphones are priced at $179.95 and include a hassle-free 2-year warranty. Use code “TRUCKER” to receive a bonus BibRave Trucker Hat ($22.95 value) with purchase of the AfterShokz Trekz Air at http://bibrave.aftershokz.com/. This is my second time reviewing an AfterShokz product and this bone conduction technology is legit! Personally I prefer the Trekz Air headphones because of their lightweight design and natural fit. I could forget I was wearing them, if it weren't for my music playing! The Trekz Air is more expensive than their counterpart but they are 20% lighter and are designed to meet the demands of elite and aspiring athletes. If you are an avid runner and music junkie, I would say these are worth the price, especially if you use the "TRUCKER" code above to get a bonus hat (the BibRave Trucker is my favorite!). Easy Run (Treadmill): 4.09 miles, 38:49 @ 9:29/mile avg. 184 spm. Tempo Intervals (Treadmill): 4.00 miles, 35:01 @ 8:45/mile avg. 182 spm. 400m x 4 @ 10k pace. Long Run (Treadmill): 7.11 miles, 1:00:00 @ 8:26/mile avg. 182 spm. Easy Run: 2 miles OUTSIDE! @ 9:30/mile avg. 3°F with -17°F windchill but the fresh air was worth it. Do you listen to music or podcasts during workouts? Any recommendations?